Dieng plateau holds thousands of natural charms and has a rich ancient heritage. 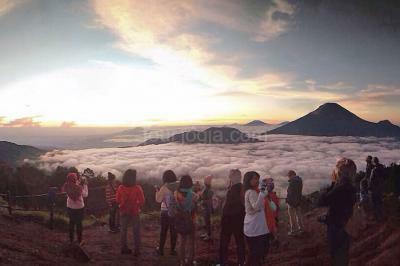 Located 116 km northwest of Yogyakarta and 2,093 meters above sea level. The misty location, sulphurous springs, ancient temples and colored lakes truly make this a place of natural wonder and high cultural significance. Come here and you will be transported back to ancient times. Dieng Plateau tours is offering beautiful and interesting natural wonders, remarkable volcanic landscape, sulphurous springs in Sikidang crater, colored lakes, potato plantation, exotic local culture, and ancient temples.